Since today is such a special day, Gringos is serving three roasted pork belly tacos with caramelized onions, spices, rice and beans for $10. This pairs nicely with a $5 Habanero, Jicama, Prickly Pear, Pineapple or Mango margarita. 631 Foothill Blvd. La Canada, (818)790-2696. 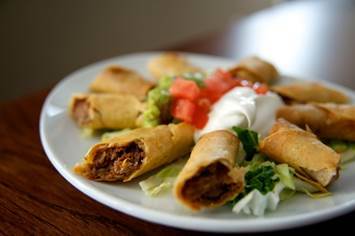 The Valley’s celebrity hot-spot is offering beef taquitos con guacamole or crispy four chicken flautas with creamy salso roja for 50% off their normal price on Friday, October 4 to celebrate National Taco Day. 13301 Ventura Blvd (818)788-4868. One of my favorite taco shops located in a mini-mall offers braised short rib with a horseradish slaw, Moroccan lamb with a chimichurri sauce, grilled shrimp with chili sesame oil, soyrizo with peppers and mushrooms, and shredded pork topped with Dijon mushroom cream. Order one of the thirst-quenching frescas. I love the fresh watermelon or refreshing blueberry/ginger beverage. 1292 S La Brea Ave. (323) 939-0161. 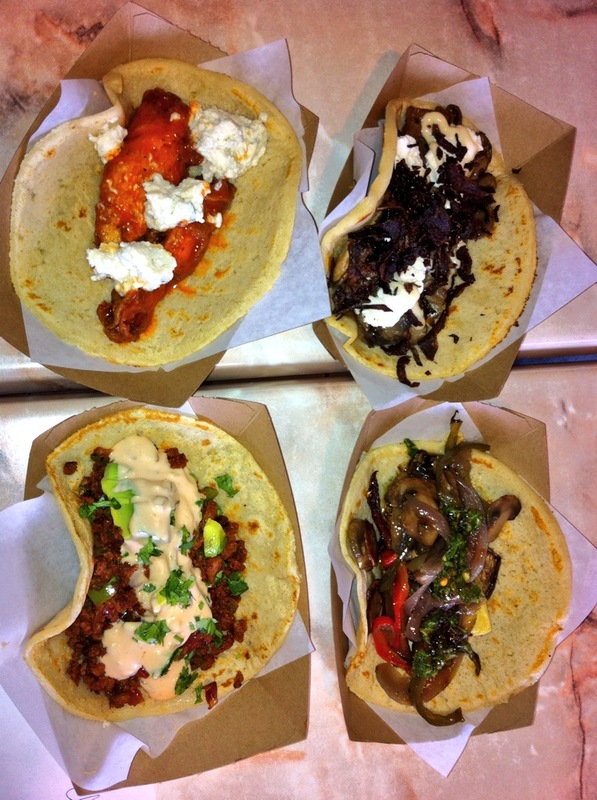 Hang out on Beverly during National Taco Day at one of the coolest taquerias in town. Chef Walter Manzke and his staff are offering one taco of your choice with a Modena on draft for $8 on Friday. DJ Stepdad – Davie Fernie will provide great tunes. 7360 Beverly Blvd. (323)933-5300. 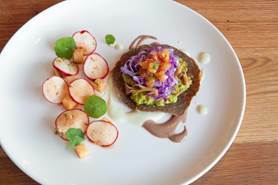 Ebanos Crossing in downtown Los Angeles is a newer dining venue offering goat tacos that are braised in Mediterranean spices and garnished with yogurt slaw and rosemary oil. Pair them with a rum, mezcal, or tequila cocktail. 200 S. Hill St. (213)935-8829. Tortilla Republic has tacos de jicama with thinly sliced jicama “tortillas” filled with shrimp, chipotle mayo, cilantro, red onion, avocado and roasted corn salsa served on butter lettuce wraps. 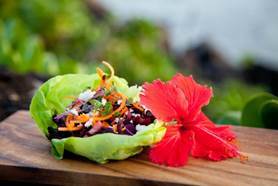 They also serve a sweet potato hibiscus flower taco has jicama, beets, queso fresco, sweet potato, hibiscus vinaigrette and cilantro. Both go nicely with a margarita. 616 N. Robertson Blvd. (310)657-9888. Loteria Grill offers the “Three Little Pigs” tacos with juicy carnitas, crispy bacon with salsa morita, finely chopped onion and cilantro with pork rind chips. Farmers Market – 6333 W 3rd St. (323)930-2211, Hollywood – 6627 Hollywood Blvd. (323)465-2500, Studio City – 12050 Ventura Blvd. (818)508-5300, Westlake Village – 180 Promenade Way (805)379-1800 and Santa Monica – 1251 3rd St. (310)393-2700. Roku Style” Albacore Tacos fuse Latin American and Japanese cuisines, wrapping chunks of albacore tuna in crispy wonton wrappers before topping them with creamy guacamole and a tangy Asian salsa. 8445 W 3rd St, Los Angeles, (323) 655-6767 and 33 Miller Alley, Pasadena (626)683-3000. Macrobiotic cuisine enthusiasts love the Tokyo TJ Tacos, featuring soy-and sake-marinated black cod or tofu in warm, sprouted corn tortillas with avocado, daikon sprouts, pickled onions, shredded cabbage, and yuzu mayo, served with choice of pinto or black beans, crispy corn chips and lime. 7119 Melrose Ave. (323)525-0588 and 9433 Brighton Way (310)858-8459. For a raw, living foods spin on the classic Vietnamese sandwich, check out Matthew Kenney’s Banh Mi Taco, with maitake mushrooms, guacamole, chipotle crème, carrot, and radish. 395 Santa Monica Place #333, (310) 394-7046. Korean BBQ has joined the taco trend with Bibigo’s Green Taco filled with bulgogi in Boston lettuce, and topped with pickled daikon slices, pickled pepper, cilantro, and fresh tomato salsa dressing. Get a taco and beer at all three locations- 1091 Broxton Ave. (310) 824-0011, 225 S. Beverly Dr. Beverly Hills (310) 275-0011 and 10252 Santa Monica Blvd. (Century City Mall) (310) 557-0011.